Compaq has always been the value segment brand of HP’s product line. The new stylish Compaq Presario CQ45 series shares many similarity (in a good way) with the higher-end HP Pavillion dv4 series but with a smaller price tag. The Compaq CQ45-127TX is based upon Intel’s latest Montevina Centrino 2 platform. The basic out-of-the-box specifications is rather under powered to run Windows Vista smoothly despite having one of the latest Intel processor and platform (1GB of RAM will sufficate Vista). Thus, I added more juice (RAM) to it to be able to run Windows Vista smoothly. Additional 2GB DDR2-667 RAM making it 3GB of RAM in total. 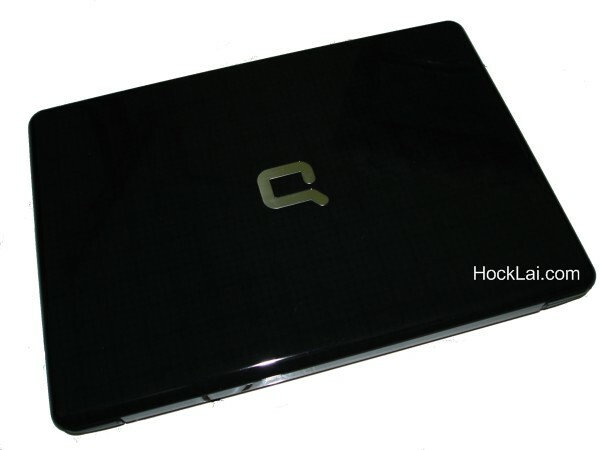 The new Compaq CQ45 now spots a black glossy finnishing on the lid with Compaq’s ‘Q’ trademark at the center of it. It looks sleek and modern but it’s also a magnet for finger prints and stains. 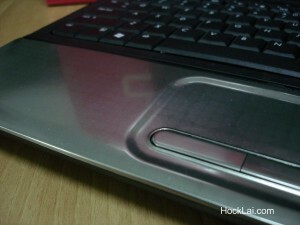 The palmrest and touch pad surface share a metallic silver (HP call’s it “liquid metallic”?) 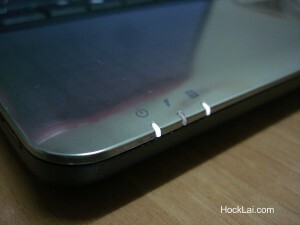 finishing with some circle patterns imprints to give it a touch of class like the HP Pavillion dv series laptop. Althought it looks nice, I’m not too keen of having the touch pad surface being as polished as this, it can be rather sticky to scroll when our fingers are not very dry. The touch sensitive media buttons (launch media, wifi/bluetooth, mute, increase/decrease volume) has a nice combination of LED colors. E.g. wireless on – blue, wireless off – orange, volume on – white, volume off – orange. The status indicators (power, charging, hard disk activity) uses a nice cool white LED at the lower left corner of the palmrest which is visible even with the lid closed. As one would expect from a value segment laptop, the Compaq CQ45 is made up of mostly plastic. 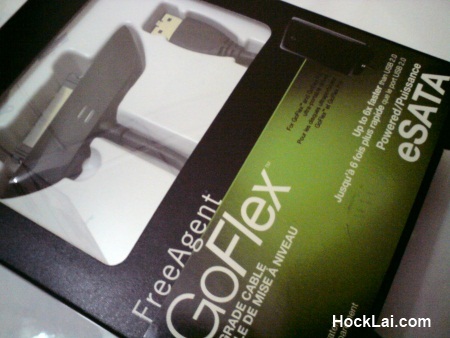 It is of good quality plastic that is rigid and barely flexes which does give it a fairly durable feel. Overall, the build quality of the laptop is good and at an acceptable weight for a laptop of this class, 2.4kg. The 14.1″ WXGA (1280×800) HP Brightview LCD screen delivers bright and vivid colors with a rather wide horizontal viewing angle. However, depending on the lighting condition of the surroundings, the glossy screen surface might be a little too reflective at times. I’ve always enjoyed typing on HP’s (and also Dell’s) laptop keyboard, and I’m glad that this Compaq laptop inherits all the characteristic that makes a good keyboard. It’s well spaced, well sized keys, good tactile feel, and doesn’t flex. In fact, this review was typed entirely on it. 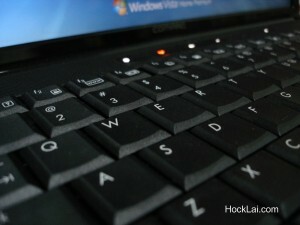 However, the touchpad didn’t quite excel as well as the keyboard. As mentioned earlier, I’m not too keen of having the touch pad surface being glossy metallic. It’s nice from the design perspective, but not very practical in usability as it can be rather sticky to scroll when our fingers are not very dry (sweaty hands nightmare?). 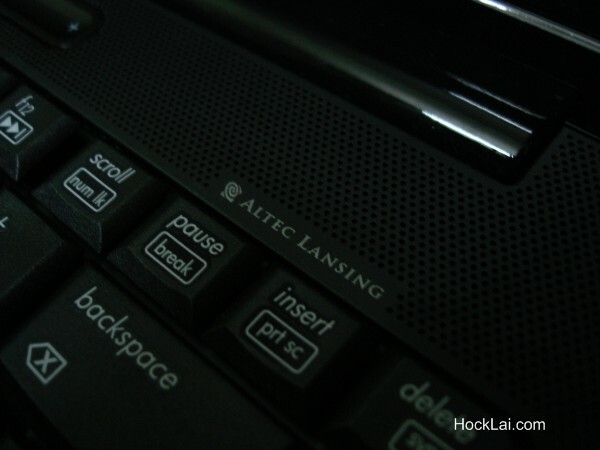 The built-in Altec Lansing speakers seems pretty good (above average) for a laptop. It produce crisp mid to high range sounds at about half the maximum volume. Raising the volume will reduce the crisp and shows the limitation of the speakers. Like most laptop speakers, the low base sounds are of poor quality due to the lack of a subwoofer. For audio enthusiast, the included headphone output would provide better sounds when connected to a quality headphone or speakers. The Compaq CQ45 is equiped with quite an array of input and output ports. It is currently one of the very few laptops in this price range that offers a HDMI output port to connect it to a LCD TV for a bigger viewing experience, but lacks a more traditional S-Video output for connecting to older video devices. It also feature an Expansion Port 3 for ease of connecting with HP’s QuickDock or Docking Station. 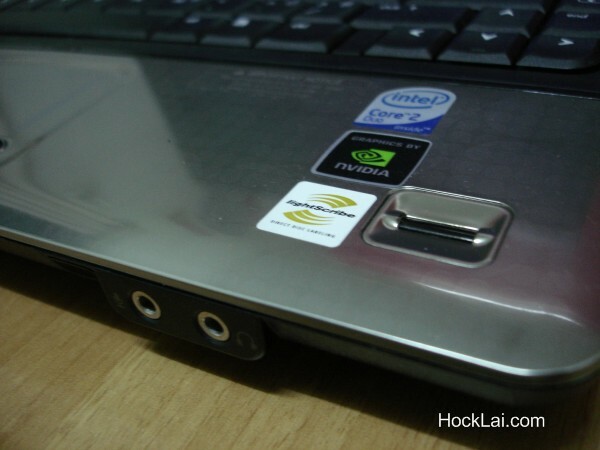 The other I/O ports are rather standard for a laptop like a VGA output, RJ-11, RJ-45, headphone, microphone, 3x USB ports (3rd port shared with eSATA port), eSATA (faster data transfer than USB 2.0), IR, ExpressCard/54, 5-in-1 card reader (SD,MMC, MS, MSPro, xD), Fingerprint reader, 1.3MP webcam. On the wireless front, this Compaq CQ45 comes with the latest intel WiFi Link 5100 that supports 802.11a/b/g/(draft)n WLAN. I do not have any wireless-n router to test if it does offer any advancement of up to 300Mbps data rate or better range from the newly supported 802.11n standard, but it does perform pretty well operating on 802.11g in a nearby cafe with wifi hotspot, receiving strong signal from about 5 meters away from the access point. The performance of the Compaq CQ45 is quite good considering it is quite well beefed up (specs-wise) for a laptop. The dedicated graphic card does lend a hand to give it a better overall score in some benchmark compared to the integrated intel graphics. The Compaq CQ45 did get a little warmer than I would appreciate, especially on the left palm rest area where it can get rather warm at about 48 degrees Celcius (the hard drive is beneath here). The underside also do gets quite warm after about 30 minutes of browsing the web and some word processing, playing 3D games would heat it up even faster. The processor is well cooled at about 34 degrees Celcius while idle and up to 56 degrees Celcius during load. However, the left and center underside could easily reach 51 degrees Celcius during idle and up to 75 degrees Celcius when under heavy load such as playing a movie or a game (the dedicated graphic card do contribute a lot to the heat). It is therefore not recommended to use this on your lap. Elevating the rear of the laptop a little could help the laptop to cool better or perhaps investing in a good notebook cooler would help ease a few degrees from the underside of the laptop. All the heat buildup does gets the fan spinning rather fast to disperse the heat out, as well as some noise from it. But its not as loud as to the point of being annoying unless its in a very quiet room. Even my ceiling fan seems to drown the laptop fan noise. By the way, the room temperature here in Malaysia is approximately 30 degrees Celcius on a sunny afternoon. The 6-cell battery included with the Compaq CQ45 performs rather mediocre and might disappoint some road warriors. 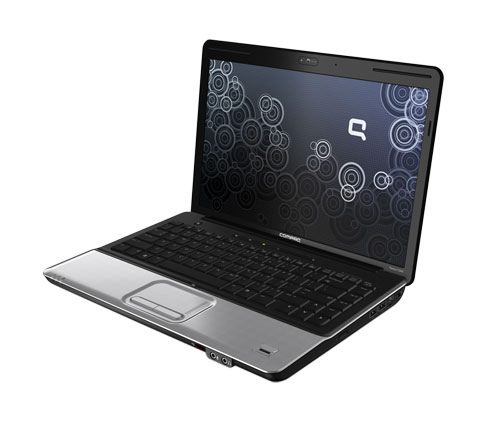 The Compaq CQ45 only manage to get about 2 hours and 20 minutes of battery life while browsing the web via wifi connectivity before it reaches critical 6% level. During testing, the screen brightness was set to 50% with all the power savings settings enabled. The Compaq CQ45-127TX is well positioned as a value for money laptop with a good price to performance (and features) ratio, with a nice design and build-quality to top it off. However, the battery life might be a little disappointing for a road warrior, and the heat might be a bit too warm for comfort on the palm rest. Maybe you could go into detail about the general price range of this laptop. Also, I heard that the chipset drivers of the CQ45 are not compatible with Windows XP, so if you’re going for Windows, it’s Vista or nothing. Is this true? can u tell me how to change operating system i want to remove vista and install to xp sp-3 but i get some fettle error so i can not install …can u tell how to done this ? Sadly, HP Compaq does not provide official driver support for Windows XP. I’ve heard of some compatible drivers around the web for CQ45 on XP, but I’ve not given it a try. Maybe I’ll try it on Win XP in the future. my CQ45-127TX only manage to hit 1 hour 30mins on vista ultimate..damn! manage to installed a vista ultimate on this .. but most of the drivers ans software were unusable .. maybe can share some link 2 it ..
cq45 127tx can support most of window vista driver for windows 7 OS..